If your home or business incurs storm or fire damage resulting in an opening in your building you may be in need of emergency board up services. Any openings in the structure need’s to be properly boarded up to protect the building from weather and illegal entry. Your insurance policy also requires you to be proactive in protecting your home or business after any type of damage has occurred, otherwise, the insurance company could account any further/secondary damage to the structure as negligence. Not every situation requires the most extensive board up that the U.S. Fire Administration have in their board up procedure manual, such as after a fire where the entire home is destroyed and is considered a complete loss. While each emergency board up services is different, let’s take a look at how to properly board up a structure the after the damage has caused an opening in the building. Openings in the basement, first floor doors, windows and any point of entry accessible from a porch, fire escape or other potential climbing point require additional security measures. These openings should be barricaded with plywood, 2x4s, bolts and nails. Openings that are at least 10′ from ground level which are not accessible from a porch, fire escape, roof, or other climbing point can be secured with nails in each brace, and every 12″ around the perimeter. For these openings the plywood should be fitted so that it rests snugly against the exterior frame, butting up to the siding on wood frame buildings and up to the brickwork on brick buildings. It may be necessary to remove the staff bead so this fit can be flush and tight. Cut plywood to fit over the window and door openings, flush with outside of the molding. Note: For buildings with metal door and window frames the alternative is to cut the plywood and 2x4s to fit the inside of the door frame buffed up against the band molding. Cut the 2x4s to fit the horizontal dimension of the plywood. 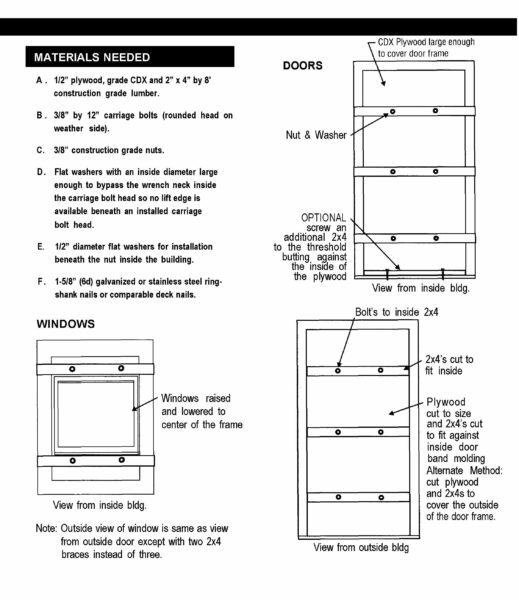 You will need two 2×4 exterior and two interior braces for each window and three sets for each door. Note: For buildings with metal doors and window frames the 2x4s for the outside will be cut to the dimensions of the plywood, fitting inside the door frame, against the band molding. For the inside the 2x4s will be cut to the outside dimension of the door or window frame. Pre drill 3/8th inch holes in the plywood and the braces. The holes will be placed approximately 1/3 of the length of the brace from each outside edge of the door and window jam. Place the plywood over the exterior opening and nail to the frame. Note: For metal frames place the plywood and braces inside the frame against the band molding. Place the 2×4 braces over the interior and exterior of the door or window. Place the large washer over the carriage bolt and place the bolt through the holes. Place washer and nut inside and tighten securely. Torque the nut so that it slightly compresses the interior 2×4.